Despite Krista's concerns, Ava was very good during the six-hour trip down to Las Vegas. She actually slept during most of the trip, and happily looked around the rest of the time. Since arriving, Ava has been enjoying some quality time with her mommy. 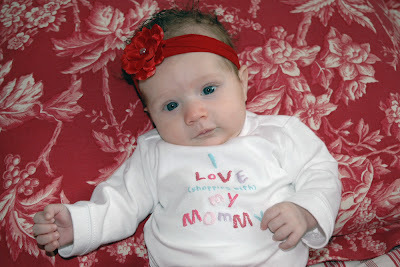 Krista bought her a little swimsuit today, which we will be sure to get pictures of her in. We've been amazed at how good Ava has been each day. Lucky for us, she seems to enjoy being pushed around endlessly in her stroller. Although she has not attended any of the basketball games with her dad, Ava's mere presence in Las Vegas seems to have helped out the Cougars, whose men's and women's teams have both advanced to the finals. Tomorrow the men take on UNLV and the women take on New Mexico. 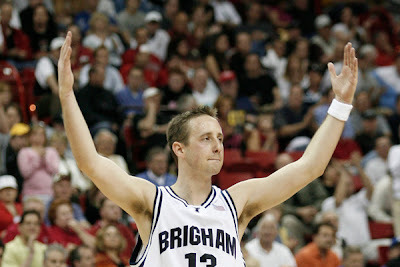 Here's hoping that BYU will sweep the Mountain West tournament. Go Cougs! LARRY- Here's hoping the Coug's do better at March madness than they did against UNLV. 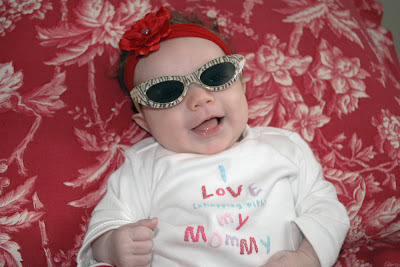 Bummer.- amy g.
She is just too cute in those little glasses...and did you buy that shirt for her too?? She is such a little girly girl, and you're obviously having a TON of fun with her!!! TOO CUTE!!! Can't wait to see her this week!! YEAH!!! She is so cute! I love the shirt it is perfect!You can tell you guys are having so much fun with her. Hope you had fun in vegas!